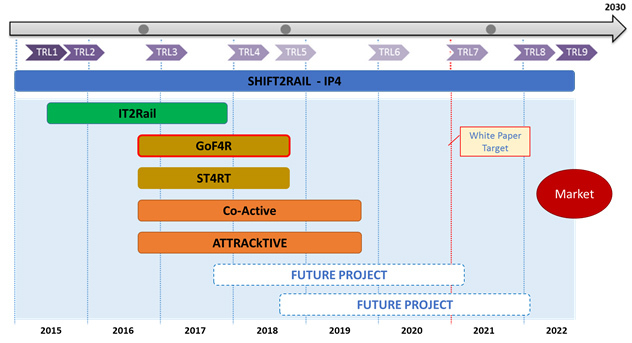 In order to achieve an early starting of the envisaged research activities, while the Shift2Rail programme was in the setup phase, some projects were started within H2020, with the aim to open the way to further and more complete activities in the related IP. The S2R light-house project initiating IP4 activities is IT2Rail (Information Technologies for Shift2Rail). Its main objective is to enable the development of door-to-door solutions providing a seamless travel experience by giving access to a complete multimodal travel offer (combining air, rail, coach and other services), which connects the first and last mile of long distance journeys. IT2Rail work packages will cover a subset of IP4 objectives, however producing results, which will allow a significant advance in the direction of the future products, so improving the achieved Technology Readiness Level (TRL).